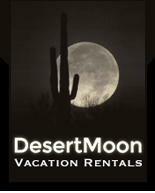 WELCOME TO DESERT MOON VACATION RENTALS! Desert Moon Vacation Rentals includes several architecturally distinctive homes for those traveling to Tucson for vacation, adventure, family visits, sightseeing or corporate reasons. Each home is thoughtfully furnished, keeping the style of architecture in mind for guest interest and comfort. The landscapes surrounding each home have been carefully designed and include a variety of native desert botanicals, and native trees to attract the Sonoran Desert's unique wildlife. Something our guests mention to us is how they love to observe the wildlife! Most of our residences are on the far east side of Tucson, in areas where mountain views are spectacular! Included in our offerings are: Desert Moon Retreat, Casita at Desert Moon, Desert Cloud at Sabino, Desert Sun Sport, Desert Star Casita, Desert Madre Moderno, Desert Callisto and Desert Metallica which are one, two and three bedroom accommodations in quiet areas, many off the beaten path for those that want to be away from it all, yet have easy access to shopping, dining, hiking, and Tucson attractions. Please mention which property or properties you are interested in. Include a quote from one of your happy customers here!